PORT-AU-PRINCE, Haiti (CNS) — As Haiti prepared to go to the polls Oct. 25 in a process whose complexity and proliferation of candidates has created a logistical nightmare for organizers, the bishops’ conference urged Haitians to vote, but warned them to beware of false electoral promises and demagoguery. Such promises are currently in evidence in every public space in Haiti. Port-au-Prince is covered, wall to wall, in brightly colored posters of smiling candidates pledging work, plentiful food and a better life for the population of the poorest country in the Americas. Colorful bills strung across the streets flutter in the wind, and local TV stations feature smiling Haitians — from peasants, to doctors and Protestant pastors — dancing and singing “Nou pral vote” (we are going to vote) to konpa and reggae rhythms. In the elections, voters must choose among 54 presidential candidates, from a broad range of parties, including the incumbent Parti Tet Kale Haitien (shaved heads, in allusion to the signature style of President Michel Martelly) to Renmen Ayiti (Love Haiti), to Verite (Truth). Although 16 of the original 70 candidates were rejected by the electoral council, some who were approved to run represent unknown parties with no real proven support base. Runoff elections are scheduled for Dec. 27. Jesuit Father Kawas Francois explained the proliferation of candidates by the lure of easy money he says is paid out by the Haitian elite and the Dominican business sector to those perceived as having a chance at winning a seat. In 2012, Dominican and French journalists exposed documents proving that incumbent Martelly received nearly $2.6 million from three construction companies belonging to Dominican Sen. Felix Bautista. The Jesuit said senators and deputies are also well-positioned to receive generous payments from those who believe they can advance their interests. Father Francois echoed concerns expressed by the bishops in an August pastoral letter in which they urged candidates to run for office to serve the common good, rather than advance their personal interests, and warned voters against accepting bribe money offered by candidates. Oct. 25 is also the second round of legislative elections to elect 118 lower house representatives from 1,624 candidates and 20 senators from 233 candidates, as well as mayors and local officials. Each voter will have to vote with four ballots — to elect president, deputy, senator and mayor and councilors. Because the Aug. 9 first round of voting for deputies and senators was annulled in 22 constituencies for violence and irregularities, the first round will be repeated in these districts. Added to the complexities already inherent in the process, the reruns further complicate what was already a logistical headache for the second round. The process also represents a significant challenge for the illiterate and semi-literate majority of voters, despite the candidates’ attempts to identify themselves by symbols and a number. The Aug. 9 round was marked by a turnout of lower than 18 percent. “It is our wish that the elections will take place and open the way to the consolidation of democracy in Haiti,” read the bishops’ October statement. In their August pastoral letter, the bishops described voting as “a democratic and civic act of the greatest importance” and warned citizens that failure to perform their civic and moral duty amounts to a serious moral lapse. Amid calls from some sectors for the cancellation of the flawed Aug. 9 round, a new electoral council and new elections, the U.S. government urged Haitian authorities to go ahead with the current electoral calendar. Failure to organize elections in 2014 because of a political dispute over the composition of the electoral council has left the country without a functioning parliament or senate since January. The terms of the country’s mayors and councilors expired in 2011, and acting mayors appointed by the executive have been in power since then. 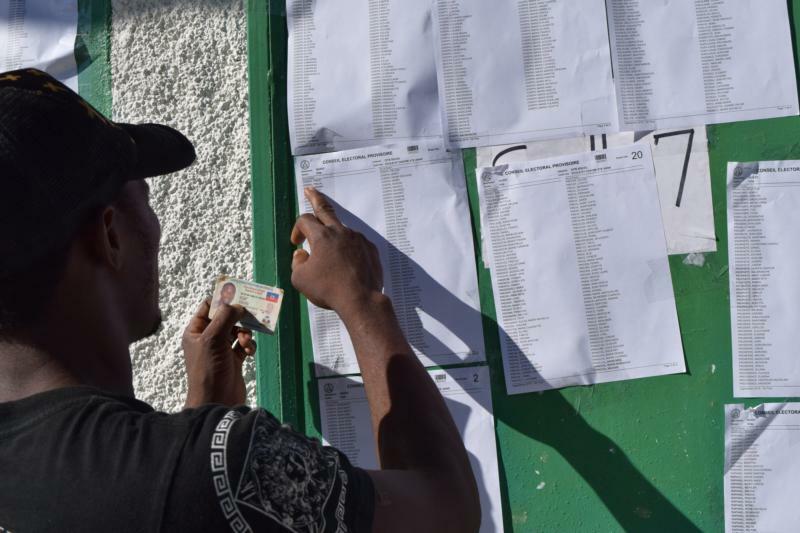 The complex process of registering and vetting candidates has been carried out by the Haitian electoral council, with the support of the U.N., which organized printing of the ballots. However, the number of candidates involved has created a further logistical challenge. Haitian electoral law allows each candidate to have a representative observing in each polling station. Because of the proliferation of candidates, the electoral council announced last week that party representatives will have to rotate in shifts of three hours in order to reduce congestion in polling stations, many of which range from the size of a suburban garden shed to that of a double garage. Apart from 54 presidential candidates, some electoral counties have up to 30 candidates for deputy and a further 15 for senator. Already, some parties have said that this provision violates electoral law, and they will not respect it. Leaders in the polls are the party of the incumbent, Tet Kale party, represented by Jovenel Moise, whose slogan is neg banann nan, the banana guy, who owns an agricultural export business selling organic bananas to Europe. A further favorite is Jude Celestin, close to former President Rene Preval. Third in the polls is former peasant leader Jean-Charles Moise of the Pitit Dessalines party, named after the fiery, former slave independence leader who rose up against the white French colonialist in a violent revolution.